With the more advanced manufacturing and design capability from processor manufacturer and board designers, conventional PC with micro ATX form factor size has been shrunk down significantly. One of the good examples here is the newly released Fit-PC Slim series from CompuLab that is claimed to be the world’s smallest Windows based PC system in today’s PC market. As compared to its predecessor, Fit-PC which was released last year, the new version of Fit-PC Slim seems to be even ‘slimmer’ but yet able to pack more features into its sleek and stylish casing. Measured at only 109mm X 99mm X 30mm, it is based on CM-iGLX COM (Computer-on-module) form factor design which is able to fit well in any space constraint office or home space. The Fit-PC Slim is powered by AMD Geode LX800 processor running at 500MHz. Backed up with either 256MB or 512MB RAM memory, the system is positioned more as entry level product targeted for those that don’t intend to run intensive applications on it. However, it doesn’t compromise with basic features that are offered by today’s PC architecture especially on the internet access capability. 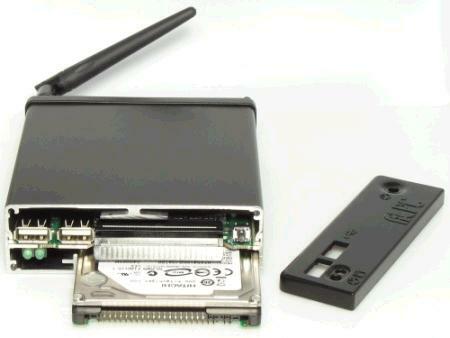 Besides the standard legacy ports such as Ethernet, USB ports and VGA video output, it is further built in with Wi-Fi module for wireless internet connectivity. The system is already available in market with a minimum selling price of $220 for a basic 256MB RAM version with no embedded Wi-Fi module. User will need to top up additional $175 in order to get slightly higher end of 512MB RAM with Wi-Fi module, 60GB hard disk drive and preinstalled with Windows XP Professional OS.